The Texas fleets are coming alive. AMYA president Ray Seta has spent the past three years building RC Laser fleets in Texas. 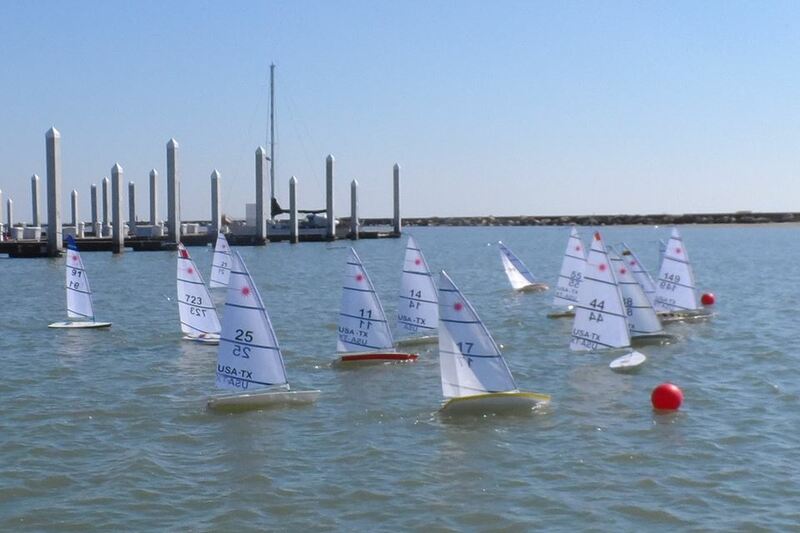 This fleet in Corpus Christi held it’s first Salt Water Challenge Regatta. Very special thanks to Sylvia Dimayuga for being our RD and Josephine Camarillo for assisting with Race Scoring, we were all in very competent hands this afternoon. We must also give special thanks to Lauren Causey for her efforts organizing our most excellent lunch and for handling registration. Yes, the ladies were in charge and we were all better off for it! The morning began with winds out of the South at 10-15mph allowing us to run races parallel to the sea wall. This venue has two great concrete walk ways, one at water level and the second on top of the sea wall allowing plenty of room for us to pace up and down the race course. A very satisfying lunch arrived at noon. With at least 7 different sandwich and taco choices to choose from, everyone could have something they liked. During lunch Ray Seta entertained the crowd with a rollercoaster style skateboarding display on the upper walk way of the sea wall. Thankfully for the AMYA he walked away unscathed. After lunch the winds quickly clocked around from South to East forcing us to reset the course and run our races out away from the seawall toward the breakwater separating the marina from Corpus Christi Bay. The winds steadily increased to 20mph allowing for a mix of B & C rigs during the last of our 14 total races. In the final hours of the Regatta a wedding party arrived and took over the Gazebo which overlooks our venue. RD Sylvia Dimayuga would not let us play our starter tape during the wedding. Fortunately, the ceremony was brief and we were back to sailing in no time at all. The young couple will forever have the memory of getting married at the Inaugural Salt Water Challenge – RC Laser Regatta. And yes, we are in the back ground of all their wedding pictures. They even took one of our brochures as a keep sake. Al Ross put on a fantastic sailing display truly dominating the rest of the fleet. He seemed especially dominate the last few hours of the regatta as he easily pulled away from the other race leaders. Filling out the top 3 were Ray Seta and Will Rottgering who never surrendered and pushed for ever more races in hopes of catching our leader. From CBMYC our friend Eric Gregory pull-in a surprising 4th as he split his time between chase boat duty and racing. We had divided our skippers into Gold and Silver fleets based on experience at the skippers meeting. Of the Silver Fleet captains our 1st Place winner was Tirza Dabdoub. Tirza not only won the Silver Fleet trophy but she also won the Special Finisher award for having the most points awarded to a skipper without a DNF or DNS. Congratulations Tirza, from now on you are in the Gold Fleet. Finishing second in the Silver Fleet was newcomer to RC Laser sailing, Butch Willson of Austin, TX. Butch gets to return home as top gun among the 5 strong Austin Team and we look forward to seeing his progression. Finally rounding out our Silver Fleet winners was Mike Causey from CBMYC. Mike has come a long way with his sailing and we at CBMYC are extremely proud of him and his performance at today’s event. Finally, we must make note of that peculiar position called “Mid-Fleet Hacker” which some seem to prize so highly. At this regatta the honor falls to everyone’s favorite sailor, John “JK” Kuc! John blew a servo which cost him a few positions at the end of the regatta but it won him this beloved position in the fleet. Congratulations to him. To all the fine racers who helped make this Inaugural Salt Water Challenge – RC Laser Regatta such a roaring success, the members of the Coastal Bend Model Yacht Club extend their greatest gratitude. Hope to see everyone next year.